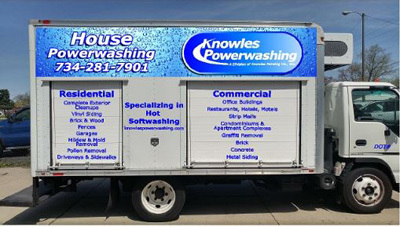 Wyandotte & Downriver, MI Residential & Commercial Power Washing | Knowles Painting Co.
Go ahead & ask - What is Hot Water Soft Washing? As one of the only companies offering hot water soft washing we get many great questions. We want you to feel confident about this service and walk away with a beautiful end result! Let’s explain that process in more detail, and take a look at some of the most frequently asked questions we get about residential and commercial power washing. Q. What is Hot Water Soft Washing? A. Water Soft Washing is a power washing method using Hot water with an injected biodegradable Soap at a low pressure. Q. Is the Hot Water Soft Washing better than High Pressure Cold Washing? A. Yes. Simply put Hot Water cleans better than Cold Water. What’s equally important though Is that using lower pressures to clean is a safer method to use on your home. The High pressure washing methods can damage the exterior of the home leaving scratch and gouge marks. It can inject water into the wall cavity or windows causing Mildew and Mold growth. With Knowles’ power washing method, you will get the exceptional cleaning results you want, without the worries that high pressure cleaning can cause. Inject water into the wall cavity or windows causing Mildew and Mold growth. Q. Why don’t all Powerwashing companies use hot Water. A. Because the equipment and training is expensive. Q. Do you use scrub brushes when you clean? A. No. Using our Hot Water Pressure Washer, we soap down the item being cleaned, let the cleaning products work along with the hot Water to break down the dirt and then give the item a Hot water rinse. Our cleaning objective is to provide a lower cost method of cleaning to our customers with a service that cleans all the surface dirt off of their Home or commercial Building. Q. Is this residential power washing process safe for my Kids, Pets and Plants? A. Yes. All the products we use are Biodegradable and safe for people and plants. Q. Do you wash the Windows? Few streaks. Remember the objective here is to soap down your property and rinse off all the surface dirt. Q. Are you fully insured? What do I need to look out for when hiring a contractor when it comes to insurance? A. Yes. We have Full Workers Compensation, Liability and Auto Insurance. Here is what and why you need these types of insurance. a. Workers Compensation: Is necessary, you could get sued in the event anybody working on your home gets hurt. Important note: Some smaller owner operated companies will try to tell you that they cannot insure themselves with Workers Compensation. This is false and they need coverage. True they can sign an exclusion form, but this only means their insurance will not cover them as you do not have to insure yourself if you choose. That does not however prevent that person, their family or their lawyer from suing you for their medical expenses and long term care. b. Liability Insurance: Is necessary if the Contractor damages your home or your neighbors. For instance, the Contractors ladder tips over and goes thru your $3,000.00 front picture window or your neighbors car window and paint job. c. Auto insurance: Something as simple as the contractor puts the Truck in the wrong gear and drives thru your garage door. You pay if they’re not insured. Q. Do you offer an annual cleaning program? A. Yes. We offer a yearly Maintenance cleaning. Copyright ©2019 Knowles Painting Co.. All Rights Reserved.